These days when everyone is on the go, both parents have to work and single parents strive to provide a better future for their children, an instant dinner is not sufficient. In our society today, organic products are becoming scarce, and more preservatives are found in instant meals that being healthy is becoming more of a challenge. We have forgotten that healthy dinner recipes are important not just for growing children but also for adults to give them the nutrients they need after a grueling day at work. Nutritious dinner recipes also provide us the stamina and energy that we need to prepare for the next morning. Idli is the traditional nutritious & healthy food popularly served throughout south India. I remember, having fluffy & soft idlies in "Murugan Idli shop" (in chennai) with atleast 4 - 5 varieties of spicy chutneys with sambar & in "Rathna cafe" they serve idlies with lotz of sambar in the banana leaf, it taste awesome. Kancheepuram idlis have a distinct taste of cumin seeds, ginger and pepper. Idli with sambar & chutney are the best combo. Soak the rice and urad dal separately in water for 4 hrs. Drain off the water and grind each of these to a batter, adding some water if necessary. Mix the two batters, salt & curd.Allow it to ferment for 7-8 hrs. Heat 4 tbsp of oil and splutter mustard seeds, asafoetida, cashew nuts, pepper, jeera, ginger, curry leaves,green chillies in it.Switch off the flame and add ghee. Mix this with idli batter thoroughly. 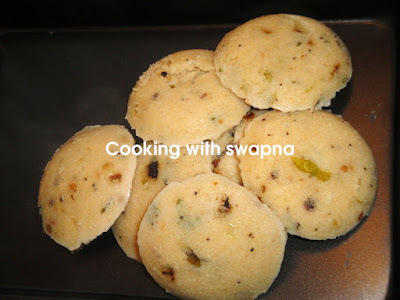 Pour this batter into the idli moulds and steam it for 10-15 mins or until cooked. Enjoy this soft & fluffy kancheepuram idli with "Gaati chutney"
I love kancheepuram idlis, they are a frequent dinner option for me :-) urs look nice and soft! looks delicious but i prepare in moulds! 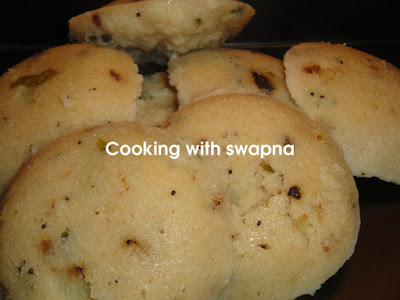 i really enjoy idlis but never manage to make them myself! so i am glad you are bringing these along to the mingle. thanks for the entry! that looks yummy, I recall the holidays last time, when we stuffed orselves every morning with different kinds of these fresh items! !Hum, waiting for the next trip!! !